Looking for a good book to read this weekend? This fast-reading romantic comedy features Sophia Smith Dubonnet, a magazine feature writer on her way up. She finally gets what seems like a perfect assignment -- interviewing a reclusive dictator -- but then events begin to spiral out of control. Despite dire warnings, the dictator and his country start to appeal to her. ​Will she get her story or will her story get to her? Just as Sophia chooses her career over her long distance relationship, she’s laid off from her job at Personna magazine. When she manages to land what appears to be a glitzy public relations assignment, challenges arise with the colorful CEO. Danger lurks when she gets too close to the truth behind the profits. Will her courage take her too far? Join our mailing list and let us know! Sophia continues her adventure with drooling dogs, designer shoes and devious divas. Some are well meaning and some are not, and they are concealing something that can be dangerous! Want a preview of the next adventure? Join here! 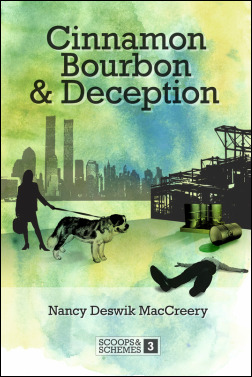 Nancy MacCreery writes for people who enjoy action and mysteries but aren't into gore. Her books feature likeable (for the most part) complex characters with a propensity for jumping into action in situations that are not exactly their business but they can't help it because evil lurks and must be uncovered and corrected for good. If you are intrigued by the challenges of our complex geopolitical world yet enjoy a touch of irreverent humor, romance and the antics of a group of intelligent, caring, sometimes fumbling and fun-loving cast of characters, Nancy’s books will offer you a great escape into a world of intrigue, trade-offs, and the crusade against greed and criminal intents. The Scoops and Schemes series includes Book 1- The Essence, and Book 2 - Unexpected Impact and Book 3 - Cinnamon Bourbon and Deception. A new, totally different book is in progress -- look for it this spring. Wonder where the ideas came from?